Tarut is a historic small island, which is located in the Eastern Province of Saudi Arabia on the Persian Gulf and it has survived for thousands of years. Tarut Island passed through several civilizations and was part of many empires and nations. Many of its antiquities are still being discovered. In addition, its castle, Tarut Castle, has survived and was built on the rubbles of past structures from an event five thousand years ago. Its port, Dareen Port, was a trade center between India, China, and Africa's eastern coast. In conclusion, we will remember about the Tarut people's social life, which is similar to other communities in the Arabian Gulf. The Shiite religion, Gulf culture and Saudi customs have heavily influenced Tarut Island's social life. 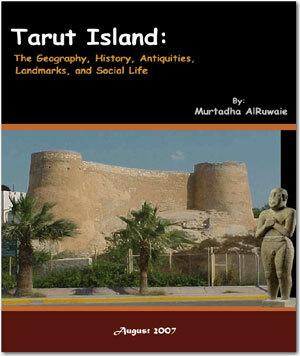 In his 53 pages booklet, Murtadha AlRuwaie captures the Geography, History, Antiquities, Landmarks, and Social Life of Tarut island. The booklet topics are distributed over four chabters.